Our top pick for the best kerosene heater is the Mr. Heater F270320 MH125KTR Forced-Air Kerosene Heater. It produces an impressive amount of heat, as much as 125,000 BTUs which it distributes across a large area of 3,125 square feet. With an 8.5-gallon capacity tank, it provides you with up to 15 hours. Our step up pick is the Pro-Temp Kerosene Radiant Sun Stream Heater. It has a heat output of 70,000 BTUs and a 4-gallon tank which will provide for up to 7 hours. We also have a budget pick based on our kerosene heater reviews for anyone who doesn’t want to spend a lot of money on a heater. 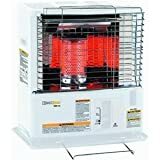 Our best budget pick is the Dura Heat DH2304 Indoor Kerosene Heater. It gives an output of 23,800 BTUs and has a 1.9-gallon fuel tank that will provide you with 9 to 12 hours. A kerosene heater falls under the category of non-electric space heaters and operates using kerosene as its fuel. In countries like the US, people use kerosene heaters only as a supplement to their main sources of heat, or in times of emergency. In other countries, however, a good example being Japan, people use them as the main source of heat for their homes. Kerosene heaters have several advantages. The greatest benefit is their reliability during power blackouts, their high energy efficiency, and the fact that they are economical to both buy and use. Kerosene is a source of fuel that has low volatility and packs a lot of energy. It is also safer than most of the alternatives since it is hard to ignite. It has a 99% combustion efficiency. It is easily available and can be safely stored in large quantities in a small space within your house. Kerosene heaters have a circular wick in their center, atop a tank filled with kerosene. The wick is made out of either cotton or fiberglass. The wick is dipped into the tank where it draws the kerosene through capillary action. When the kerosene-drenched wick is lighted, the kerosene instantaneously becomes a gas. The burning of the gas in gas heaters generates heat which mingles with the molecules of the surrounding area, heating them up through convection and all objects within range through radiation. Most of them don’t require electricity, but some do use it for ignition or to power a fan that pushes hot air out into the room with force. Most use battery-powered ignition instead. The more the surface of the wick that is exposed, the greater the amount of heat generated. When the exposed surface of the wick is larger, there is more kerosene burning, which means there is more heat production. The quality of your kerosene also affects heat output. If it is contaminated with dust or debris, it will cause clogging of some of the wick’s capillaries, which reduces the amount of kerosene on the wick. With less kerosene to burn, naturally there will be lower heat production. These are cylindrical in shape, which enables them to disperse heat in 360 degrees, that is, equally in all directions – upward and outward. They are the best choice for large areas and can even heat multiple rooms simultaneously. They are not ideal for small, closed spaces such as bedrooms. If you have one, place it in a central location for the best heat distribution. With one or two of them, you can heat an entire house. Their fuel tank is located just below the wick and combustion chamber. After absorbing the fuel, the wick delivers it into the combustion chamber. Since they do not have a removable fuel tank, you have to move them for refilling. To refuel, you use a siphon pump. Ensure your unit has a fuel gauge. Convection heaters are larger than radiant heaters, have a higher energy output, have a thirstier appetite for fuel, and can be compared to furnaces in the way they heat all the air in a room. These space heaters have a rectangular shape and generally favor smaller areas. They reflect heat from the burner element into the open space. Unlike the former, they do not supply heat in all directions. Instead, they direct towards a specific direction. They are best for apartments. They too have a wick and combustion chamber. However, unlike convection heaters, they also have a reflector, which directs the heat towards people or objects. Some come with electric fans, which help increase the flow of heated air. Most of them come with a removable tank, which means a unit can remain rooted in one spot without having to be moved. All you have to do is take off the tank and take it with you to where you have your fuel stored. You will save some of the money you would have spent on heating bills if you use a kerosene heater to supplement the heat source you already have in place. You can turn your central heating system off and use a kerosene heating device in the room you are currently occupying. During wintertime, you can’t do without heat. In case of a power cut or blackout, you will need a heat source that will continue supplying heat as you wait for the power to come back on. They are perfect for use at different job sites. This is especially convenient for people who work outdoors. They can keep you warm while you work in the cold of winter. Since these devices are portable, you can easily carry them from one site to another, from one room to another, to the garage, and so on. This makes them a better alternative than most other types of heating alternatives. Kerosene is one of the cheapest fuels you can use in heating. The costs are lower than those of propane heaters using propane tank fuel and electrical heating devices. A propane heat source, portable propane heater or torpedo heater is typically much more expensive. Heat output is measured in BTUs (British Thermal Units). The best heating devices produce a great amount of heat, and so this factor was critical to us while looking for the best unit. How far does the unit disperse the heat it produces? Is it far enough to heat a small room, a garage, a job site, or a gym? When picking the best ones, we were biased towards units that have a broader range. For how long does the heater produce heat on a full tank before requiring a refuel? The longer it can last, the more worthwhile it is. The best units provide heat for longer. Kerosene, as any other fuel, is dangerous. We were therefore careful, in selecting the best units, to consider only those that have the right safety features – for instance, automatic shut-off. After hours of testing and researching, we settled on the Mr. Heater F270320 MH125KTR Kerosene Forced Air Heater as the best unit. Naturally, we were looking for a unit with the best possible set of features, which is what you get with the F270320. It covers as much as 3,125 square feet, which is quite impressive. In addition, it produces up to 125,000 BTUs. The tank can carry up to 8.5 gallons, which should give you up to 15 hours of heat. It also has an adjustable thermostat. It has pneumatic tires to ensure smooth transportation, so you can easily move it around in your house or garage. The F270320 also has some of the best safety features. To prevent overheating, it comes with over-heat safety sensors and auto shut-off. In addition, it has a high-output fan that distributes heat evenly and rapidly throughout the entire area. One flaw it has is that it’s a bit noisy, but considering the amount of heat it produces, that is something you can learn to live with. Our second best unit is the Pro-Temp Kerosene Radiant Sun Stream Heater. It has an impressive heat output of 70,000 BTUs.The 4-gallon tank will provide you with heat for up to 7 hours. It is a radiant kerosene heater and has a fan-forced heating system. It also has a power on/off switch. You will really like the Sun Stream heater, whether you are a professional or a Do-It-Yourselfer. The unit is ideal for construction sites, farms workshops, warehouses, garages, farms, hangars, and any other place where you might need a portable heater. The best part is that it has Radiant Heat technology, which means that wind will not affect the flow of heat. The radiant heat technology does this without the usual loud noise that is associated with kerosene forced air heater units. In addition, the Sun Stream heater is CSA certified. If you really need a kerosene heater but don’t intend to fork out much to get one, you can still get a good one. 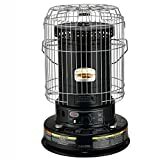 One of the best units in this price range is the Dura Heat DH2304 best indoor kerosene heater. It produces 23,800 BTUs of heat. The 1.9 gallon fuel tank should give you between 9 and 12 hours of operation. It is round in shape, and projects the heat in a 360-degree radius, allowing anyone in close proximity to get an equal distribution of warmth. The Dura Heat DH2304 has a user-friendly design that automatically raises the wick without the need to reset the emergency shut-off first. It has a sturdy construction and a durable, rugged steel frame. If you are looking for a forced-air heating device, your best choice is the Mr. Heater F270270 MH75KTR Forced-Air Kerosene Heater. Thanks to its versatility and safety features, it is one of the best options for an outdoor jobsite. It provides output that is fixed at 75,000 BTUs. On a full tank (6 gallons), it will give you approximately 11 hours of service. It can supply to an area of approximately 1,875 square feet. One thing we loved its sturdiness. It is built with rugged steel which will last for long, and comes with a heavy-duty high output fan. The fan pushes out air forcefully, projecting it wherever you want it to go. The output is instant, efficient, and economical. For safety, it has an overheat safety shut-off. It also has a thermostat, a fuel gauge, a lighted on/off switch, an easy-off access panel, six-function LED diagnostics and continuous ignition. Igniting your heater with a matchstick can be a frustrating task. It may even be unsafe sometimes. In this case, it is best that you consider a heating device that has an automated igniter. Our best one in this category is the Sengoku KeroHeat CTN-110 Kerosene Heater. The unit also comes with an EZ flame adjuster. With the 1.2-gallon fuel tank, you can expect the heating to last for up to 14 hours. It produces 10,000 BTUs, and is ideal for use in both indoors and outdoors environments. For your safety, it has features such as a tip over switch, automatic shut-off switch and a safety protection guard at the front. If you are looking for a safe kerosene heater, this is one of your best options. It also comes with a siphon pump to help in you refueling. If you are looking for something you can easily take with you from place to place, we believe the Kero World KW-24G Indoor Portable Kerosene Heater is your best choice. Its small and portable design makes it easy for you to carry with you wherever you want. 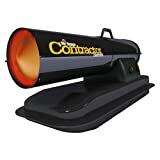 Being a convection heater, it is round in shape and disperses heat in all directions (360 degrees), increasing the temperature of the entire room. For that reason, it is best to place it in a central location so that all areas within the room can get an equal distribution of warmth. It produces 23,000 BTUs, which it distributes over an area of 1,000 square feet. If you are tired of having to use matches, this unit comes with easy, matchless ignition. For safety, there’s a 360-degree protective grill surrounding the unit. It has a built in fuel tank that accommodates up to 1.9 gallons of fuel. When full, it will give you up to 12 hours of heat, but do ensure you only use clean kerosene. This unit is one of the best options for heating small to medium indoor spaces. Some units are best for indoor use, while others are best for outdoor use. 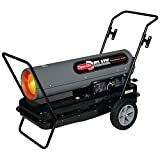 The best unit for use in outdoor job sites, when you have to work at night or in cold weather, is the Mr. Heater F270370 MH175KTR Kerosene Heater. Its best feature is the sheer amount of space it covers and the amount of heat it produces. We are talking 175,000 BTUs distributed through an area of 4,250 square feet. As a forced-air unit, it uses a high-output fan to push air with force to cover the entire area being heated. It has oversized pneumatic tires which are useful in helping you push it smoothly from place to place, even in rugged terrain. For safety, it comes with over-heat safety sensors and has an automatic shut-off feature. It also has a power indicator light. For our best convection heater, we chose the Dyna-Glo RMC-95C6B Indoor Kerosene Convection Air Heater. The unit produces up to 23,000 BTUs of heat which it distributes across an area of 1,000 sq ft. It is one the best units for heating small to medium indoor spaces. With its 1.9-gallon tank, it will warm the area for between 8 and 12 hours. Convection heaters have a cylindrical shape, which enables them to provide 360-degree distribution of heat around the room. Place the unit in a central location for best results. The Dyna-Glo RMC-95C6B comes with an easy to use automatic ignition. This makes it both convenient and safe, since you don’t have to use matches any more. In addition, it has one-touch shut-off. For increased safety, it comes with a built-in safety switch which automatically powers off the unit if someone accidentally knocks it over. Radiant heaters are smaller, generate less heat and consume fuel at slower rates. Radiant kerosene heaters can be compared to small fireplaces, whereas convection heaters are like furnaces. Our best in this category is the Sengoku HeatMate HMN-110 Kerosene Radiant Heater. It is highly portable, and can be used both indoors and outdoors. It has a power output of 10,000 BTUs and a fuel tank capacity of 1.2 gallons that lasts up to 14 hours. For safety, it comes with a tip over switch, automatic shut-off switch, and a safety protection guard. It comes with a siphon pump to assist you in refueling and has four C batteries. It also has an automatic igniter (no matches) and an EZ flame adjuster. If you need something to keep you warm while you are busy with your DIY projects in the garage, the Dyna Glo Delux KFA180DGD Kerosene Heater is your best option. It supplies 140,000 to 180,000 BTUs, which it distributes over an area of 4,200 sq ft. It is a forced-air heater. It has a 13-gallon tank which lasts 10 to 12 hours. It uses dual-heat technology that enables you to switch between high and low settings. This enables you to manage heat levels, comfort, and fuel savings. The two heat settings you can choose between are 180,000 BTUs as the high setting and 140,000 BTUs as the low setting. For easier movement, it has a large ergonomic rear handle, a front handle, and 10-inch wheels that are flat-free. This means that the tires are immune to punctures and leaks. The ergonomic handles make it easier to lift the heater, and the tires make it easier to move on rugged terrain. If there is a flame-out or overheating situation, the unit has integrated safety sensors that will automatically shut it off. That ensures safety for you and the DIY project you are working on. Other great features on this unit include sure-fire spark plug ignition, built-in diagnostics, always-on thermostat, construction-grade steel drain plug, and a dual source power cord for charging your tools or phone. While there may be many other best kerosene heaters in the market, these are the best at an affordable price range. Some are in the right price range but we did not feature them because we confined the list to the ten best units. There are others which we didn’t even consider, owing to some weaknesses and limitation. These include units which produced a low heat output, those that cover a small area, those that cannot produce heat for a long time without requiring a refuel, and those that did not have enough safety features. Q: What are some of the dangers posed by even the best kerosene heaters? Burns – Direct contact with the unit can cause burns. Keep children and pets at a safe distance from one when it is in operation. Fire or explosion – Fire may occur when you operate one too close to your furniture, draperies, or other combustibles. It may also happen if you accidentally knock it over, or if you ignite the fuel by accident when refilling the tank. If you use the wrong type of fuel, there will be explosions. Fires may also occur if you use your unit in an environment that has combustible fumes. Asphyxiation – Since they consume oxygen for combustion, operating one in a poorly ventilated room will cause the oxygen level to drastically reduce to dangerous levels. When oxygen supply is incomplete, there will be incomplete combustion, and that will lead to carbon monoxide production. One of the scariest things about this gas is that it is odorless and colorless, so it is impossible to know when it is in the air. If you inhale too much of it, it can render you unconscious or even lead to death. Indoor air pollution – We have already talked about carbon monoxide. Other pollutants a kerosene heating device will emit include carbon dioxide, sulfur dioxide, and nitrogen dioxide. These are especially dangerous for asthmatics, children, pregnant women, elderly people, and people who have cardiovascular disease. Q: How do I deal with these hazards? Due to the danger of carbon monoxide poisoning and death by asphyxiation, ensure that the rooms have a good ventilation system, allowing the carbon monoxide and other gases to go out and fresh air to come in. Open the window or door when using your unit. Never leave a kerosene heater unattended, and do not leave it operating when you go to sleep. Take special precautions when you are refueling. Ensure the unit is off and cooled to room temperature. Ensure the fuel is at room temperature as well. If you refill a hot unit with cold fuel, there will be overfilling, and this will cause damage to your unit or a burst of uncontrollable flames when the fuel expands. If your unit has a removable fuel tank, always take the tank outside to refill. You should never refill your unit indoors. Do not refill near combustible materials. Do not go above the “full” mark when refilling – give room for the fuel to expand without leaking. Place the unit in a safe spot. It should be a well-ventilated area that does not contain furniture, curtains, and so on – no combustible materials should be close. It should not be a high traffic area, lest someone knocks the unit over when walking past. It would be best if you have working fire extinguishers, smoke detectors, carbon monoxide detectors, or air quality monitors in your home. Ensure every family member, including children who are old enough, understand how to use the fire extinguisher. Keep the fire extinguisher in a location everyone can easily access, and ensure they all know where you have placed the fire extinguisher. Due to the toxicity and flammability of kerosene, the best place to store it is in a safe, secure place, where your children and pets can’t get to it. Store it in a specially designed container to ensure no one mistakes it for another substance. The best container for the job would be one which is designed to hold fuels. It should be clearly labeled “KEROSENE”. To differentiate it from gasoline, store it in a blue rather than a red container. The storage area should be cool and well ventilated. Never use gasoline in your unit, as this is likely to cause fire or explosion. Even a small quantity of gasoline or some other fuel mixed with kerosene is potentially dangerous. Use water-clear, 1-K grade kerosene. Grades other than 1-K are likely to cause release of air pollutants into your indoor environment. They also gum up kerosene heater wicks. On burning, colored or cloudy kerosene emits an odor, smoke, and higher amounts of sulfur dioxide. A: How can I tell when there is something wrong with my unit, and what should I do? In the event that a unit that doesn’t light, just check to see if the tank is empty. If the tank is empty, it’s time for a refuel. Remove any impurities you find in the system. Inspect the igniter batteries. Adjust the wick to ensure the igniter is in contact with the top of the wick. If the igniter is faulty, replace it. In the event of a flame that flickers or dies, get rid of any water in the system. If the wick is covered in tar or carbon, burn it clean. Trim away dirt from the wick. In the event of a smoky or smelly flame, lower the wick – that reduces the flame’s size. Take your unit out of the way of direct drafts. Ensure the chimney is level. Burn off the carbon or tar from the wick. Trim any dirty parts from the wick. Clean out impure kerosene. In the event of a wicker that burns too quickly, clean out impure kerosene from the system. In the event of a sticky wick adjuster, clean out impure kerosene, and burn clean the wick that has carbon or tar. In the event of a worn out or damaged wick, replace. Q: How do I repair my unit? Take out the wick and use absorbent paper to dry it. Drain both the burner tank and the cartridge tank. Wipe up any drops of fuel that spill out. Refill the tank with water-clear, K-1 grade kerosene. Dispose of the dirty fuel by getting in touch with your local hazardous waste recycler to give you instructions. Empty out all fuel from the tank. Turn the wick up until it is at its highest position. If you cannot ignite it automatically, light it with a match. Ensure the chimney is centered properly. Let the wick burn until fire goes out so that no carbon will remain on the wick. Get rid of any remaining ash using an old toothbrush. Use the vacuum to get rid of any soot or residue in the burner area. Empty out all the fuel from the tank either by draining or burning it off. Allow complete cooling of the heater. Activate automatic shut-off as per the manufacturer’s instructions. In most units, this would involve merely hitting the unit’s body with your hand. Take out the chimney after opening the front grille. Take out the safety shut-off reset lever – just pull it out of the cabinet. Slide the electrical wire connectors off the battery case. Take out the screws at the side of the extinguisher assembly. Take out the extinguisher assembly (just lift it out). Take out the wick adjuster mechanism – loosen the wing nuts until it’s possible to turn the retainers that hold wick adjuster mechanism in place. Take out the wick – fold it and slide it out. Installing the new wick: turn the wick adjuster counterclockwise to its farthest extremity. Insert the new wick: fold it and slide it into the adjuster. Ensure the red line on the wick’s outside matches the adjuster’s bottom edge. Turn the wick adjuster clockwise to its farthest extremity. Inspect the wick’s height. Press the wick against the adjuster’s teeth for a firm grip. Slide the rubber packing over the new wick, allowing the wick’s tails to drop down. Put the wick and the adjuster mechanism back in the fuel tank, ensuring the wick fits well in place. Place the adjuster knob at the heater’s front. Tighten wing nuts onto the retainers. To ensure the mechanism has smooth functioning, turn the knob clockwise and counterclockwise. Inspect the wick’s height again. If the height has changed, readjust it. Put the cabinet back on the fuel tank. Put back the automatic shut-off reset lever in its slot. Push it and it will snap into place. Slide it fully to the left to reset the auto shut-off mechanism. Put the chimney back. Snap the grille shut. Ensure the wick’s top is even and level. Give it 20 minutes before you light your unit. This will give the fuel time to saturate your new wick. Avoid cutting, pulling, or soiling your new wick. Put the burner, guard, and batteries back in place. Take the batteries out of the case to prevent shock or accidental ignition. Give the unit some time to cool down completely. Take out the guard and burner. This will enable you to have access to the ignition mechanism. Press down the ignition knob. Take out the ignition coil – push it in while turning it counterclockwise. Install your new ignition coil. Q: I want to store my unit for the summer. How should I do that? The first thing you do is drain the fuel from the tank and get rid of it. Over the summer, the fuel may undergo chemical alteration and spoil. If the wick is dirty, clean it. If it is worn out, replace it as per the manufacturer’s instructions. Clean your unit and get rid of weak batteries. If the batteries are in good condition, store them in a dry place and tape their ends. Store your unit, along with its accessories, in containers that are free of dust and moisture. The box the heater came in is a good choice. Q: What should I do when I want to take it out of storage in the fall? Refill the tank with fresh fuel. Do not use fuel from the previous season – it may be spoiled by now. Q: What causes bad odor? A: This means that you are using low quality fuel. It has a bad odor because it has high sulfur content, or perhaps because you are using old fuel or low-grade kerosene. Such fuel does not burn completely. As a result, unburned hydrocarbons accumulate on the wick, hardening it and reducing its efficiency while causing bad odor. Replace your fuel with clear 1-K grade kerosene, and burn the carbon clean off the wick. The strong smell may also be as a result of burnt fuel that has dripped on the unit. Ensure you don’t drip fuel on the unit when refueling. If any drips or spills occur, clean them up at once. Never refuel indoors. If you operate your unit at a temperature that is too low, or if you install the wick too low, there will be incomplete burning of the fuel, and that will cause a bad odor. Q: My unit keeps flickering out. What is the problem? A: If the unit is new, or if the wick is new, this may be a case of insufficient soaking of the wick before lighting. You must allow the fuel to fully saturate the wick. When it’s insufficiently soaked, air bubbles form in the capillaries of the wick and prevent a natural flow of fuel. Soak the wick in the down position in a tank full of fuel for no less than 60 minutes. If it is not a case of a new wick or unit, the fuel could be the problem. If you are using low-quality fuel or fuel that has water in it, it will clog the wick fibers and interfere with the flow of fuel. In this case, replace your wick and your fuel. Q: My unit is smoking. What should I do? A: Always use quality 1-K grade kerosene. Do not use gasoline or any other type of fuel. If you use other fuels, they are likely to burn too hot or may cause your unit to burn out of control. If you harbor any uncertainty about the fuel in your unit, drain it, and replace it with the quality 1-K grade fuel. You should also replace the wick. Sooty smoke could also be a sign of an off air/fuel mix. Inspect your chimney to ensure it is seated properly. Check also that the wick isn’t too high. If the heater is still smoking, give it some time to cool down, and then inspect its burner cylinders. Any soot-plugged holes require cleaning. Replace any dented or buckled pieces. Ensure the wick is installed correctly and at the proper height – you can consult the manual for the exact height. If the problem persists, take your unit to a service center. 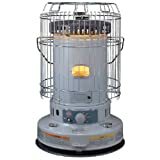 Our pick for the best kerosene heater is the Mr. Heater F270320 MH125KTR Forced-Air Kerosene Heater. 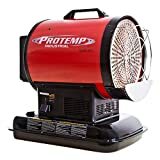 Based on our kerosene heater reviews we admired it for its impressive output of 125,000 BTUs, its broad range of 3,125 square feet, and its 8.5-gallon tank which provides up to 15 hours.